Pete’s Dragon was holed up in the Walt Disney vault for a while. Then, in 2009, Disney popped the film out of the vault to bring it on to DVD. The picture quality of the set was pretty nice, the bonus features were pretty unmemorable, and DVD buyers probably either bought the set for it’s nostalgia value or for the excellent “Candle in the Water” track. It’s only been three years since Disney brought Pete’s Dragon out of the vault, but the film is already getting another release. 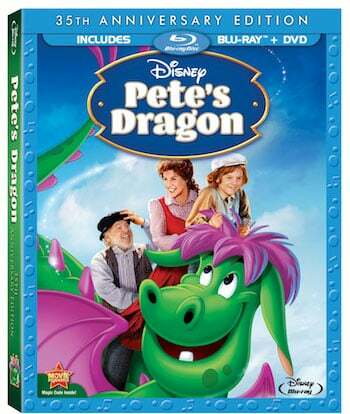 On October 16, Pete’s Dragon is coming to Blu-ray. The release has been set to coincide with the friendship story’s 35th Anniversary, which is kind of cute. The film went through some brand new digital restoration for the Blu-ray release, which may or may not make the picture look a whole lot better (I would vote on the latter, since I own the DVD copy and the picture already looks pretty great). Mum’s still the word on the special features, but Disney has already released the cover art. Disney’s been on a role recently with Blu-ray releases. The Great Mouse Detective hit homes earlier this month, and Disney has the first Cinderella Blu-ray release in the works for October 2. Additionally, the Mickey Mouse company has been putting together 3D releases for some of its biggest hits. I’m not surprised Pete’s Dragon won’t be getting the 3D treatment, but it is a little bit surprising to learn the know the film is beating some of Disney’s more prominent titles, including the Arabian love story Aladdin, to Blu-ray.